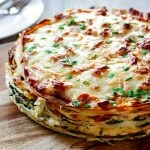 A savory crepe cake made with tender gluten free crepes layered with loads of spinach, sweet caramelized onions, salty ham, and a cheesy béchamel sauce stacked high and baked till golden and bubbling. Add all the dry ingredients to a large bowl and the wet ingredients to another large measuring cup or bowl. Beat the eggs into the liquid ingredients. Slowly add the wet ingredients to the dry while whisking. Whisk until they are fully combined and there are no lumps. You can also use a blender for this, which works great! Heat a crepe pan, or a medium sized round skillet on medium heat. When the pan is hot, spray it with a little cooking oil and pour in ½ cup of crepe batter. Swirl the batter around to cover the whole bottom of the pan. Let it sit until the edges start to look cooked. Slide a spatula around the edge of the crepe and if it comes up easily, slide the spatula or flipper under and flip the crepe over. Cook for another 30 seconds to a min, take the crepe out and place on a plate. Repeat this process for the rest of the crepes. Next make the spinach and onion mixture. Chop up your onions and throw them in a large skillet on medium-low heat with the butter and salt. Cook for 10 - 15 mins or until they get nicely browned and caramelized. Add the spinach bit by bit and cook till it is all wilted down. Remove from heat and set aside. Then get the béchamel cheese sauce going. In a medium pot melt the butter on medium heat. Then add the cornstarch or flour and cook till combined and thick. Slowly add the milk, whisking as you add it. Cook until the milk starts to thicken. Add the cheese, nutmeg and salt. Stir until the cheese is fully melted. Turn the heat off and set aside. Get the ham and grated cheese ready. Cut your crepes to the same size by using the bottom part of a springform pan as a guide. Reassemble the springform pan and start building layers inside the springform pan. Start with a crepe, spread 3 tbsp of béchamel sauce on top of the crepe, then spread 3 tbsp spinach and onion mixture over the crepe, then sprinkle 1/4 cup of the chopped ham on top, followed by a light sprinkling of grated cheese. Repeat until all the crepes are used and you run out of filling. The last crepe will have a little béchamel sauce spread on top, ham and grated cheese. Bake in a 375 degree oven for 30 mins or until the top layer is all melted and starting to brown. Remove from the oven and let it sit for 5 – 10 mins before you slice into it.